We pick the healthiest, most nutrient-rich food choices for your Thanksgiving plate. It's perfectly all right to indulge at Thanksgiving dinner. After all, this special day comes just once a year, and you don't want to miss the opportunity for a few of your favorite foods—seasoned stuffing, creamy potatoes, juicy turkey and, of course, pie. But for all its bad reputation, Thanksgiving is actually a wonderful holiday to eat healthful foods that still satisfy all your cravings. Unlike candy-centered holidays—we're looking at you, Halloween—Thanksgiving's main event could easily feature a number of nutrient-rich dishes, and no one at your table would be any wiser to the improved offerings. "Thanksgiving is a holiday where there's plenty of opportunity to eat healthy," says Wendy Kaplan, M.S., RDN, CDN, a registered dietitian nutritionist. "Staples such as green beans, Brussels sprouts, sweet potatoes, cranberries, corn, pumpkin and turkey are all nutrient-rich options to pile on your plate." The key is to tweak some of the traditional recipes to make them a bit healthier before you dig in and focus on choosing some of the better options on this list. Remember though, Thanksgiving is just one day. Keep your feast somewhat healthy by making sure some of the best foods are on your plate, but don't forgo your favorites. And be sure to turn your leftovers into healthy dishes like Leftover Turkey Salad or Cream of Turkey & Wild Rice Soup. Read on to learn how to turn some of Thanksgiving's most unhealthy traditional foods into some of the best. The traditional sweet potato casserole features mashed sweet potatoes, butter and sugar with a topping of brown sugar and pecans or fluffy toasted marshmallows. It may have started as a vegetable dish, but it ended up nearer dessert. "When taking a simple and wholesome ingredient like sweet potatoes and burying them with butter, sugar and marshmallows, you lose the great taste of the sweet potatoes, and add a ridiculous amount of processed sugar," says Elizabeth Huggins, RDN, at Hilton Head Health, a health and wellness resort in South Carolina. Virtually any other preparation for sweet potatoes is better than the classic casserole. Roasted, baked, boiled, mashed—they all serve up delicate sweetness and lots of fiber, potassium, iron, magnesium and vitamin C as long as you limit the amount of butter and keep the added sweeteners to a minimum. 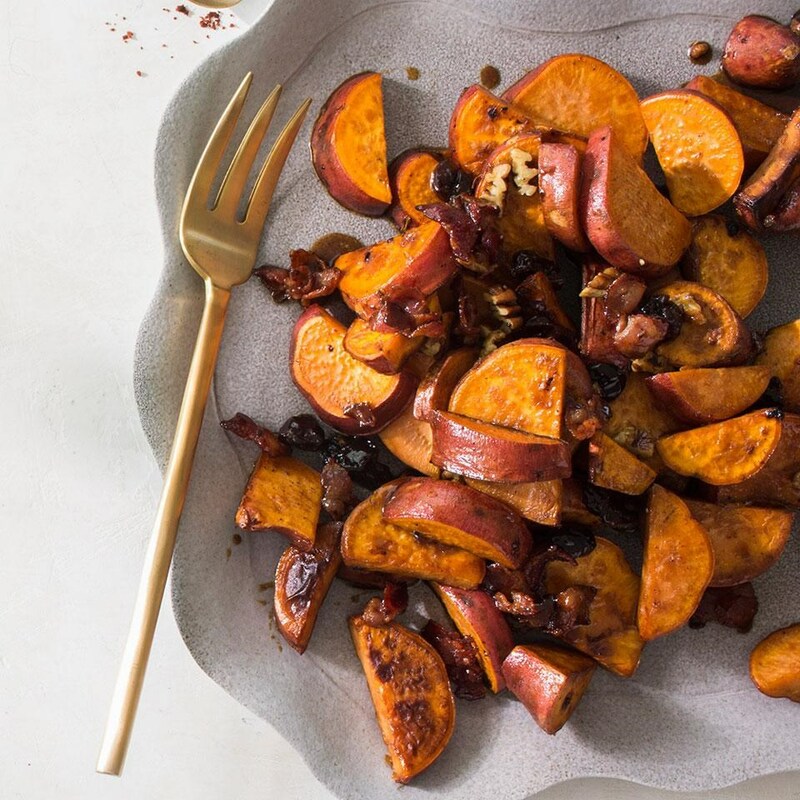 "Roast sweet potatoes with a tiny bit of maple syrup and a mix of traditional fall spices like cinnamon, nutmeg and cloves," Kaplan suggests. "Roasting enhances the natural sweetness of foods, so this cuts out loads of butter and the excessive sugar in candied yams." It may be a serious time-saver, but you'll pay dearly in other ways for premade or boxed stuffing mixes. "Boxed stuffing is notoriously high in sodium," Huggins says. "The fresh savory flavor is often overpowered by the salty taste." On a day when you're likely getting more than your necessary serving of sodium, it's best to cut back where you can. Plus, white bread offers little in the way of nutrition and flavor. 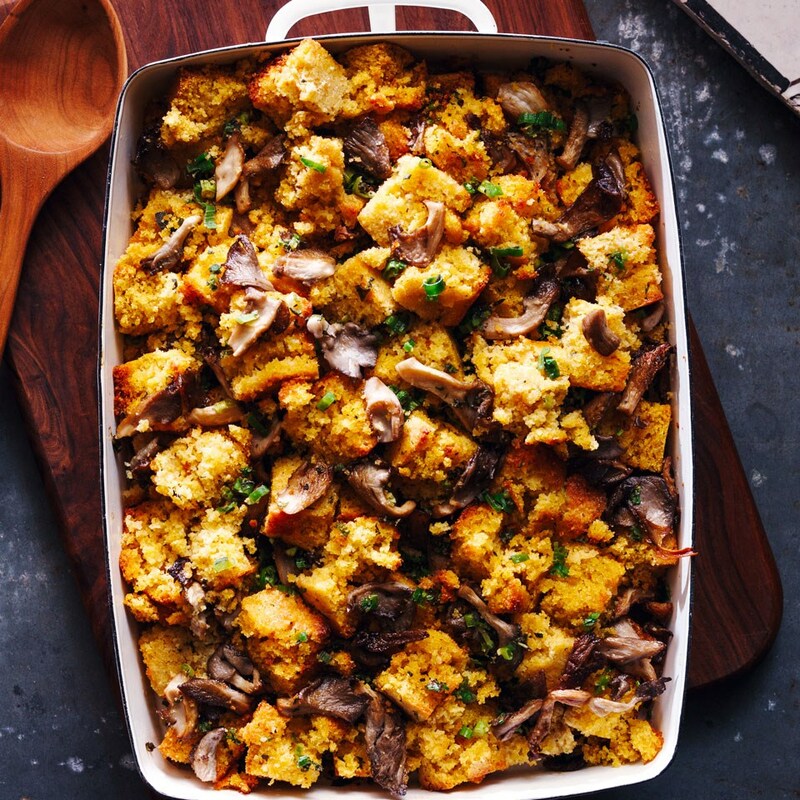 Whole-grain options like whole-wheat bread are a better base for Thanksgiving stuffing because they're naturally more flavorful than white bread. The bread's toasty, nutty flavors are enhanced with fresh spices and low-sodium chicken broth. You need little else to make this dish special. You may also consider a bread alternative entirely. "In place of the usual bread stuffing, which is typically made with white bread, try Southern cornbread dressing," says Ann Taylor Pittman, author of Everyday Whole Grains: 175 New Recipes from Amaranth to Wild Rice. 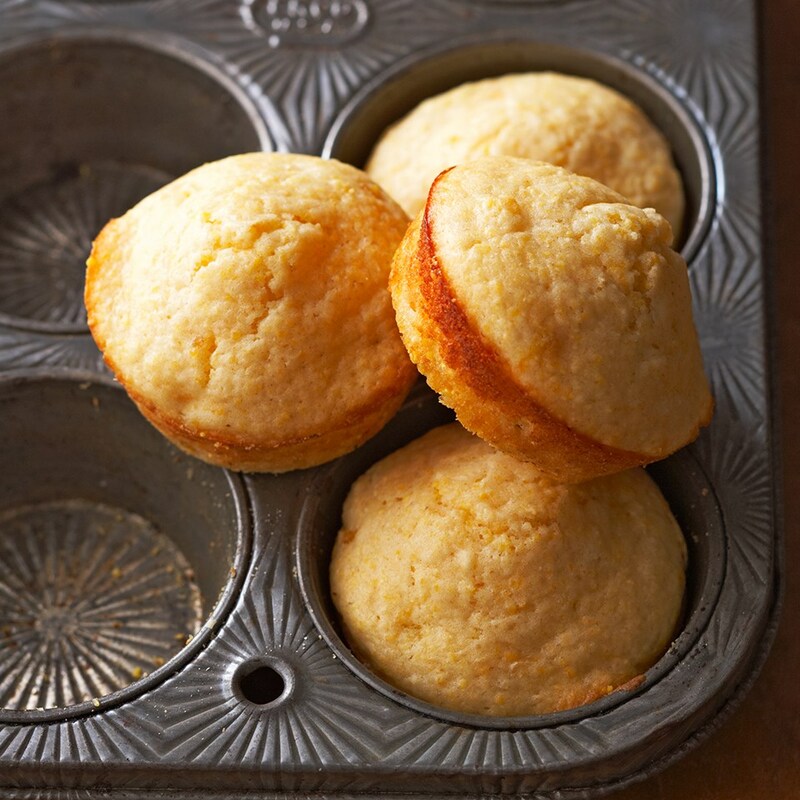 "It starts with a pan of homemade cornbread, which allows you to control the ingredients. You can choose whole-grain cornmeal and whole-wheat flour for a more nutritious whole-grain base." Both whole-grain options are full of fiber and other nutrients. Fiber is filling and good for our digestion and gut health. If pecan pie feels overly decadent, that's because it is. 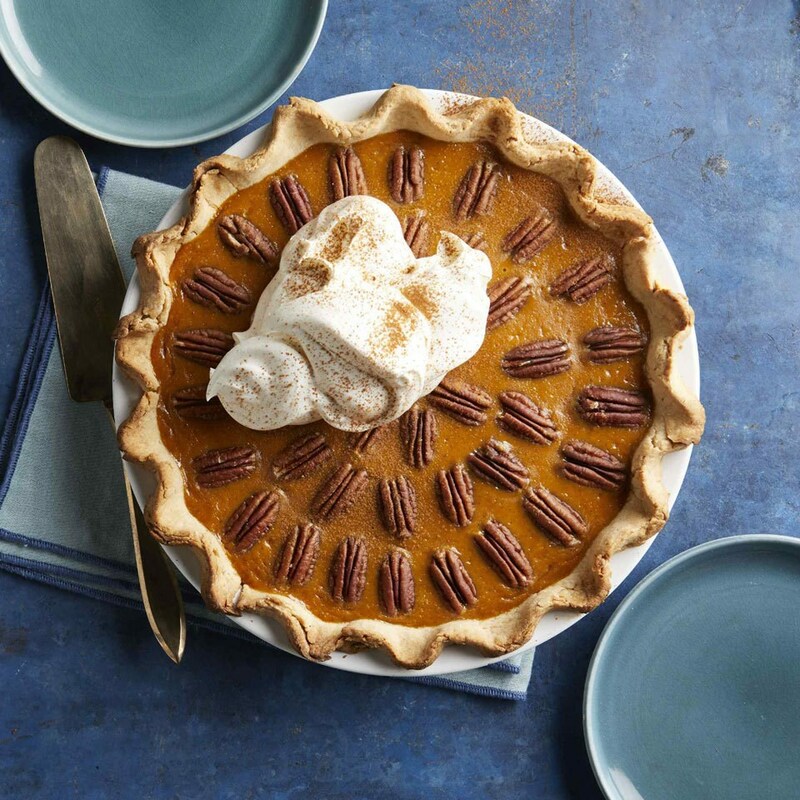 "Traditionally made with a generous amount of sugar and corn syrup, pecan pie is a highly concentrated source of sugar and calories," Huggins says. "An average one-eighth slice of a 9-inch pecan pie has about 500 calories." No one should ask you to forego dessert on this special day—certainly we won't. Instead, it's about making picks that are satisfying, sweet and perhaps deliver a bit of nutritional value at the same time. Yes, the classic Thanksgiving dessert actually gets the check mark. "Pick pumpkin pie for fiber and beta carotene," says Becky Kerkenbush, M.S., RD-AP, adding that you should "skip the whipped cream topping and ice cream, too." Keep the total sugar count as low as possible—pumpkin has a wonderful natural sweetness—and use maple syrup to add delicate sweetness to the filling before baking. Don't be shy with spices like cinnamon and nutmeg, which can make the pie seem sweeter without the additional calories. For starters, ham isn't traditional. (It's called Turkey Day, after all.) Yes, it serves up protein, which will help you feel satisfied faster and keep you full longer, but that's about the only benefit. Lean portions of ham can be low in fat, but a whole ham brings with it a great deal of fat, the saturated kind that's not great for heart health. Ham is naturally high in sodium too. Most preparations for this pork product add even more sodium. Glazing can add a lot of unnecessary sugar. 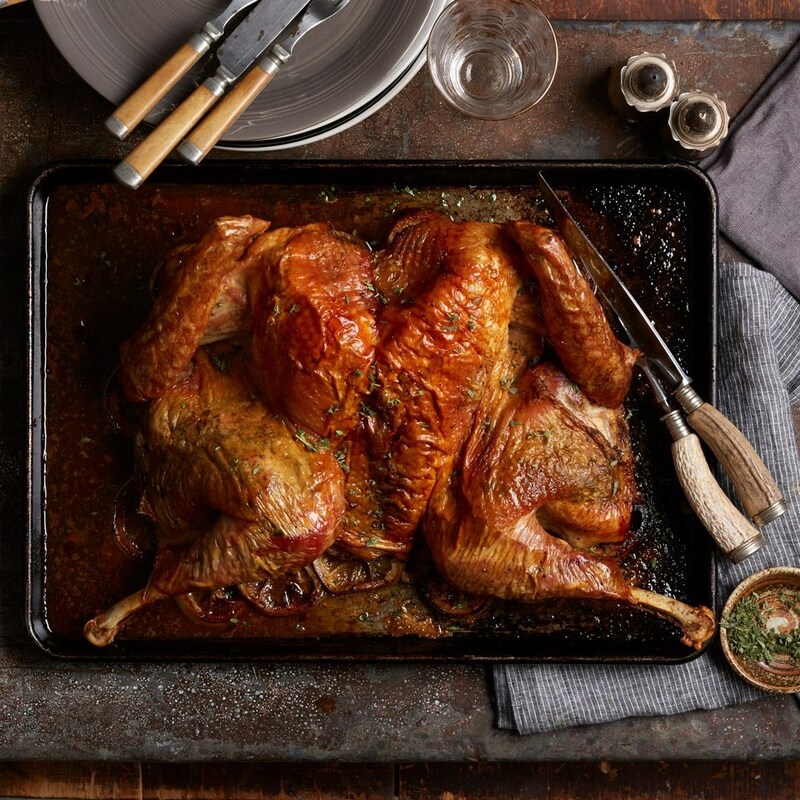 Turkey is rich with protein, and it can be quite lean. Turkey also provides iron, zinc and potassium. 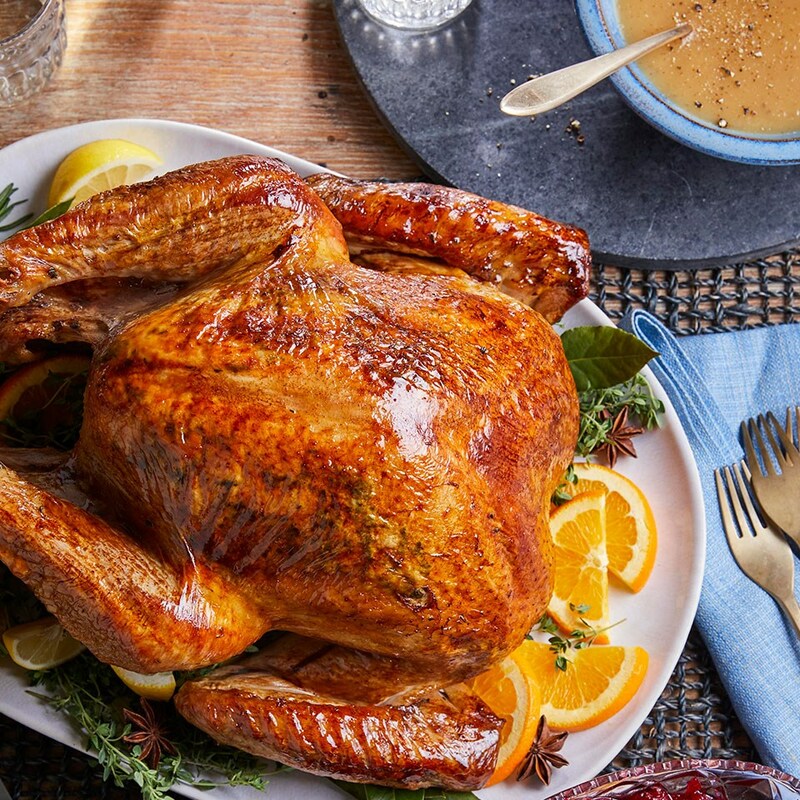 The key with the Thanksgiving turkey, however, is to prepare it in such a way that you highlight its delicious natural flavor without adding unnecessary calories and sodium. Learn tips for how to buy and store a turkey. Healthy doesn't mean dry and flavorless. "Add fresh herbs, olive oil, salt and pepper to the breast and stuff with a variety of aromatics such as lemon, apple, onions, garlic, rosemary and sage," Huggins says. White meat is leaner than dark meat, but dark meat boasts a richer, more intense flavor. Choosing white-meat turkey over the dark meat will save you about 50 calories in 3 ounces, so if you love dark meat, go for it. It might be made with green beans, but there's very little that's redemptive in a traditional green bean casserole. Between the butter, cream of mushroom soup and crunchy fried onions, you're scooping a heaping spoonful of fat, calories and salt. If you choose to serve green bean casserole—it's a traditional dish for many, so it may be mandatory for your family table—pair it with other veggies that scale back on the toppings. Simple is best for veggie sides. Or make a healthier version with these healthy green bean casserole recipes. Case in point: Brussels sprouts, which are rich in vitamin C, fiber and glucosinolates, a compound that may fight cancer. 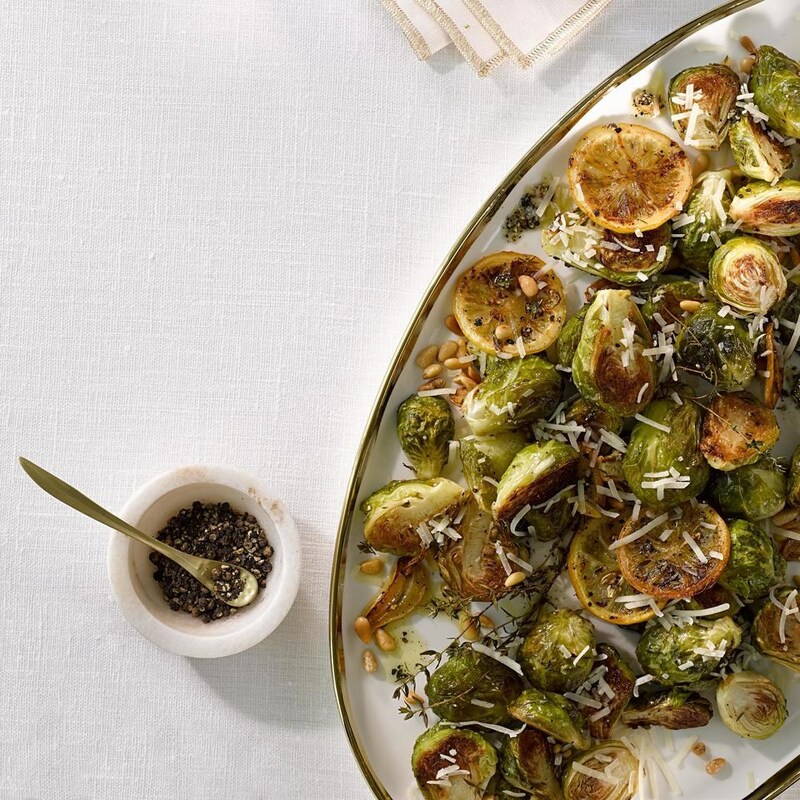 "Roasted or sautéed Brussels sprouts can add a nice contrast of color, texture and balance to your Thanksgiving meal," Huggins says. Luckily, Brussels sprouts have become a beloved side dish as well (though not everyone is a fan). They're still a healthy dose of green vegetables at your table even if you sauté them with a little bacon or cheese to make them more tempting. Though cranberries are healthy little fruits, they aren't enough to give the healthfulness thumbs-up to canned cranberry sauce. A 1/4-cup serving of canned cranberry sauce has 24 grams of sugar—that's 6 teaspoons!—most of which is added in the form of corn syrup. Save your sugar fix for your pie plate, where you'll really enjoy it. Fresh cranberry sauce is an easy way to add a great deal of nutrients to your Thanksgiving plate in a small serving. The whole berries are rich in vitamin C and flavonoids, compounds that may help prevent certain types of cancer and urinary tract infections. Plus, the berries' deep ruby-red hue comes from the phytochemical anthocyanin, which has anti-inflammatory and anti-cancer properties too. Most homemade recipes use sugar to mellow the tartness of the cranberries. 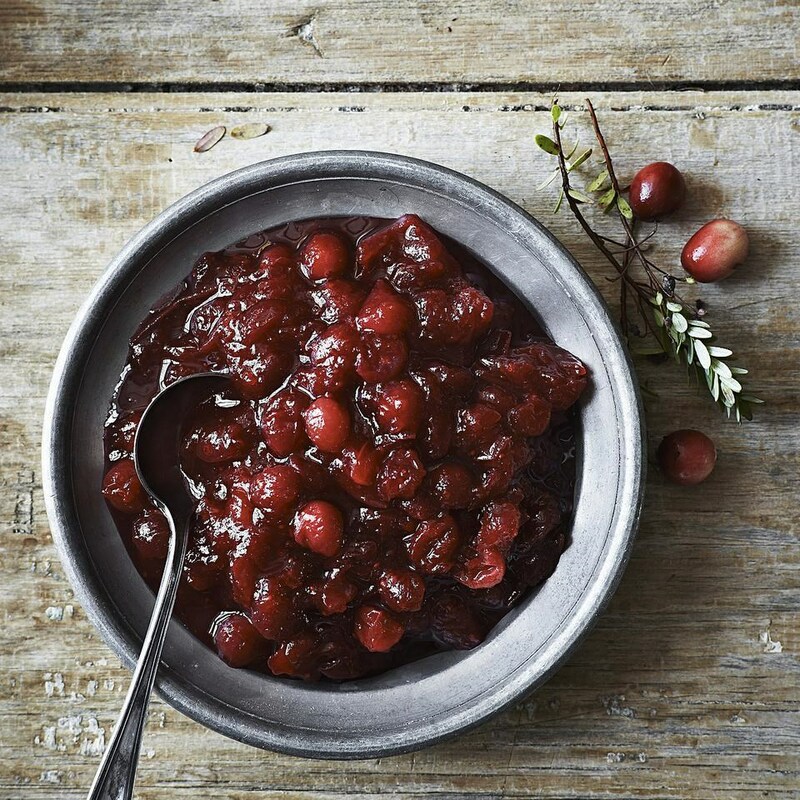 Adding juice to your cranberry sauce can help you use less added sugar. Or try our recipe for No-Sugar-Added Cranberry Sauce which is naturally sweetened with dates and apple cider. A seven-layer salad earns very few healthfulness points. It's more main dish than side salad, thanks to the layers of bacon, cheese and eggs. Plus, a thick, creamy dressing, typically made from sour cream or mayonnaise, adds fat and calories to an already loaded option. Here again, simple is key when you're talking Thanksgiving sides. 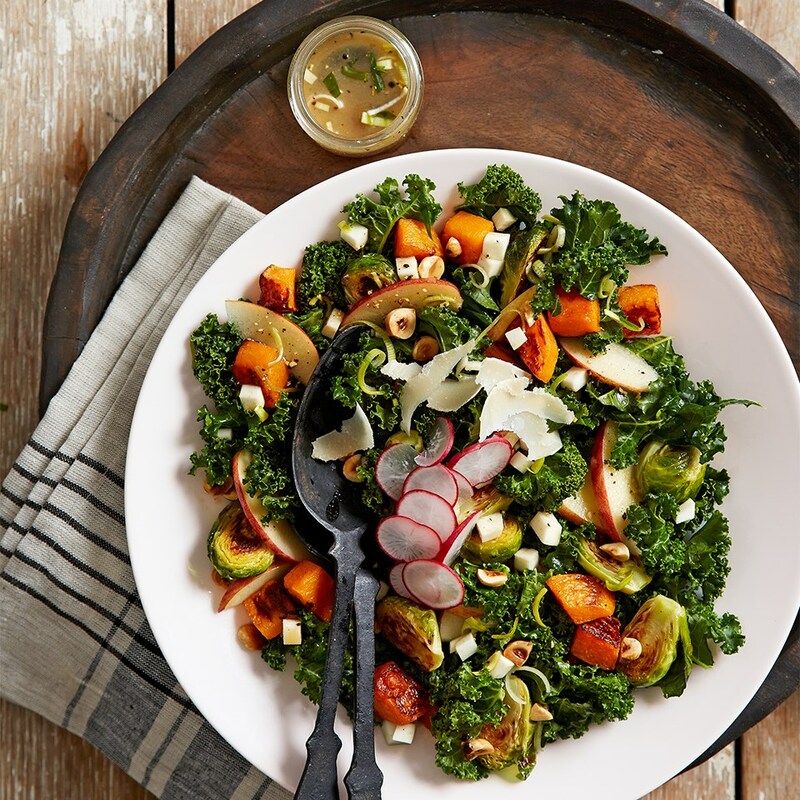 Kale, arugula, spinach and romaine lettuce all make a spectacular and nutrient-rich salad. Just be careful how you dress them to avoid layering on unnecessary calories and added sugar and sodium. Dinner rolls aren't inherently bad. They're carb-rich, to be sure, and you may add a hefty dose of fat-rich butter before chomping down. But, all in all, they're just not so special—which is precisely the problem. You don't have to skip the rolls. (What else will you use to sweep up the last drops of gravy?) Just make a smarter pick—one with whole grains. "If you're making or buying fluffy dinner rolls for the feast—and for those highly anticipated next-day sandwiches—go ahead and go whole-grain," Pittman says. "Everyone will appreciate a basket of warm bread, so why not build in a little whole-grain goodness?"